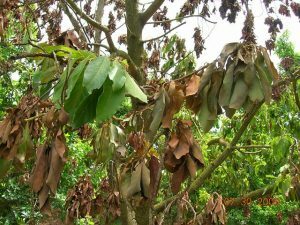 Laurel wilt has destroyed thousands of avocado trees in most counties across the state. While the deadly disease has not yet made it to several Panhandle counties, experts say it’s only a matter of time. Laurel wilt is caused by a fungus carried by ambrosia beetles, a nonnative insect to Florida. So far, six counties have not yet reported the deadly disease: Escambia, Santa Rosa, Okaloosa as well as Gulf, Franklin, and Wakulla. “It’s not a matter of if, it’s just a matter of when they’ll report that they have laurel wilt, and that’s because these native trees throughout the state different species in the laurel family and are susceptible to the pathogen these beetles are carrying,” said Jonathan Crane, a tropical food crop specialist with the University of Florida. While he says there’s not much that can be done to prevent further spread of laurel wilt, Crane says if you suspect the disease, contact the state Agriculture department’s Division of Plant Industry. For proper tree removal, Crane says avocado tree owners should use local disposal teams or contract a licensed company. Rapid wilting and insect boring are signs of laurel wilt. How to stop Chemical synthetic Fertilizer Pollution? Just stop using synthetic chemical Ammonium Nitrate Fertilizers. Make the switch to Free Fertilizer. And you’ll be free from synthetic chemical fertilizer forever ! Visit the wikipedia page for “organic fertilizer” for must-know information. Chemical fertilizer pollution is the true cause of red tide, It should be called Chemical Fertilizer red Tide. NORTH NAPLES —Red tide has spread along the Collier County coastline this week as thousands of dead fish have washed up along the beaches in Sarasota and Charlotte counties. Collier County reported toxic blooms of the microscopic algae at medium levels at Barefoot Beach, at low levels at south Marco Beach and Seagate, and at very low levels at Vanderbilt Beach. Red tide can kill marine life and cause coughing, sneezing and watery eyes in people, though the county hasn’t received reports of dead fish since Nov. 27 and just one report of respiratory irritation since Nov. 15. The county staff is warning people with emphysema and asthma to use caution when going to the beach. More water samples are set to be taken Monday. The Sarasota Herald-Tribune reports dead fish started washing ashore on Monday. Crews spent Thursday afternoon cleaning the beaches along Blind Pass, Manasota and Englewood Beach. 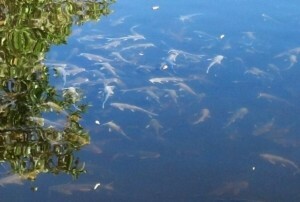 He said most of the dead fish are large mullet. Tatge suspects a large school of mullet likely got caught up in a red tide bloom and washed ashore because of strong wind from the west. In Collier County, to report red tide symptoms, call 239-252-2502. Red tide updates are available by calling the county’s hot line at 239-252-2591 or by going to www.colliergov.net/redtideupdate. _ The Associated Press contributed to this report.